Chiropractor Care - Austin's #1 Birthing Center Personalized Care! Did you know that recent studies indicate that almost 80% of women experience lower back and/or pelvic problems (and pain) during pregnancy? In addition, the inability to do much about it has led many women to feel that they could not enjoy their pregnancy due to such discomfort. During pregnancy, there are millions of different processes that go on in your body that are all coordinated through your central nervous system. Your hormones are changing and their are chemical reactions taking place all the time during development in both you and your developing baby. During pregnancy is when you need a nervous system that is adapting and accurately responding to all the requirements necessary. This is why it is crucial that you see a chiropractor during this important time. According to recent studies, chiropractic care may result in easier pregnancy including increased comfort during the third trimester and delivery and reduced need for analgesics (pain medication). In one study, women receiving chiropractic care through their first pregnancy had 24% reduction in labor times and subjects giving birth for the second or third time reported 39% reduction in shorter labor times. In another study, the need for analgesics was reduced by 50% in the patients who received adjustments. In addition, 84% of women report relief of back pain during pregnancy with chiropractic care. When women receive chiropractic care throughout pregnancy, the sacroiliac joints of the pelvis function better. As a result, there is significantly less likelihood of back labor (contractions and sharp pain felt in the lower back during labor). Chiropractic care has helped new mothers become more comfortable breastfeeding (posture-wise) as well as to produce more milk. Chiropractic care has also been shown to reduce the likelihood of postpartum depression. Chiropractic care prior to conception promotes a more regular menstrual cycle and optimal uterine function. It prepares the body to be strong, supple, and as balanced as possible to carry the pregnancy. Restoring proper nerve supply to reproductive organs has helped many couples who thought they were infertile. And adjusting women throughout pregnancy is one of the most rewarding parts of our work, because a healthier pregnancy means an easier labor and delivery, and a better transition for the baby into this life. A person’s spine is made of 24 movable bones called vertebrae, plus the sacrum (tailbone), pelvis, and skull. From the brain, nerve impulses travel down the spinal cord, branch out into nerves, and exit between the vertebrae. When the vertebrae become misaligned or unable to move properly a condition called vertebral subluxation, it irritates and interferes with the nerves. The message from the brain is slowed down and the life-energy carried by the nerve is unable to reach the organs and tissues at full potential. A doctor of chiropractic aligns the vertebrae and pelvis through gentle adjustments to the spine, relieving the pressure on the nerves and allowing the full nerve energy to reach the tissues it serves. As you gain weight, especially in the abdomen, this exerts a downward, forward pull on the lower spine. This extra weight combined with changes in your gait and centre of gravity can set the stage for backache and neck pain. Additionally, as labor approaches, your body secretes a hormone called relaxin, which loosens ligaments. 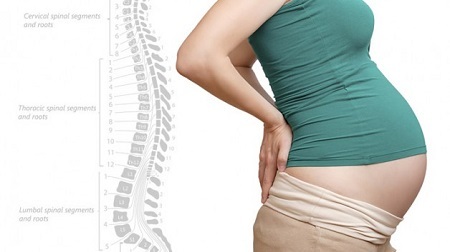 This may exaggerate the effects of an existing spinal or pelvis problem. The positioning of the baby and its movement as well as expansion of the lower part of the ribcage to accommodate your growing baby can also cause discomfort in the ribs and upper portion of the lower back. Additionally, your increasing breast size in preparation for lactation can create upper back subluxations. traumatic, labor is stalled, the mom becomes fatigued and overwhelmed by pain, so the utilization of epidurals, forceps, episiotomies, vacuum extraction, and caesarean increases. This is why squatting is the preferred position—gravity works to help and the pelvic outlet can open to a greater degree. Squatting during delivery results in decreased use of forceps and a shorter second stage of labor than the semi-recumbent position! Moreover, research has shown that coached pushing in the second stage of labor does not improve the short-term outcome for mothers or babies, except when the baby needs to be keep “baby blues” at bay, regain their energy and lose the weight they gained during pregnancy. If you need a chiropractor during your pregnancy, please make an appointment and we'll get you in as soon as possible. pregnancy, labor, and post-partum. Some women are hesitant to try acupuncture during pregnancy, specifically the early stages of pregnancy. The first trimester is a dichotomy: as it is filled with elation and joy and is also an unnerving and fragile time for expecting moms. Regular acupuncture during pregnancy sets the foundation for a healthy mother and baby. In addition, women who receive acupuncture during pregnancy often have a shorter and easier birth experience than women who don’t receive acupuncture. Several European studies concluded that women who received acupuncture once a week during the last month of pregnancy had significantly shorter labors than women who did not receive any acupuncture. Acupuncture has the most optimal results when the patient receives treatments on a regular basis throughout pregnancy. Acupuncture works very effectively on acute conditions, but is most effective when it has the opportunity to prevent illness, pain or discomfort. This is especially true during pregnancy. Regular maintenance through acupuncture can help alleviate problems as women go through the various stages of pregnancy. Acupuncture and TCM provide specific treatments for each of the three trimesters of pregnancy: The first trimester sets the foundation for a healthy pregnancy, reduces nausea and assists with prevention of miscarriage. The second trimester tends to be the easiest for most women, but acupuncture can help to maintain balance in the body and offer relief from common complaints such as pain, heartburn, and constipation etc. The last trimester is a time when acupuncturists work to prepare the body for labor and delivery, reduce stress and anxiety, increase good quality sleep and help prevent preeclampsia and other conditions associated with the end of pregnancy. Pregnancy is a sacred and reflective time, as women are striving to be their absolute healthiest for the wellbeing of their baby and to allow for the most blissful prenatal experience. If we are able be care for and nurture ourselves as mothers to be, we will be increasing able to be present to the needs of our babies and families at large. Pregnancy is a time when women deserve to feel jubilant and literally full of life! Acupuncture works effectively on the mind body connection, providing mental and physical relief for the mother and baby. It can provide a time of solitude, expression, deep relaxation, understanding, comfort, and vibrant health.